An extortion definition is often the other side of a bribery case. Extortion meaning is defined as the obtaining of property from another, with the other party’s consent induced by wrongful use of actual or threatened force or fear. Economic extortion definition is present when an employee or official, through the wrongful use of actual or threatened force or fear, demands money or some other consideration to make a particular business decision. That is, economic extortion definition cases are the "Pay up or else" corruption schemes. Accordingly, a demand for a bribe or kickback, coupled with a threat of adverse action if the payment is not paid, might constitute examples of extortion definition. 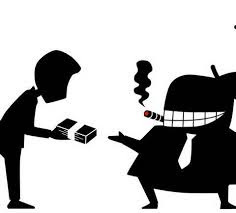 In any situation where an employee might accept bribes to favour a particular company or person, the situation could be reversed to a point where the employee extorts money from a potential purchaser or supplier. A plant manager for a utility company started his own business on the side. The manager forced vendors who wanted to do work for the utility company to divert some of their business to his own company. Those that did not “play ball” lost their business with the utility.